Christmas Party Approaching? Time to get those teeth whitened! As the festive season approaches, you will get busy preparing for feasts and planning for parties. Amongst all this frenzy, one aspect that always gets neglected is your teeth. While you make appointments for personal grooming, why not book an appointment to visit a dental doctor too? After all, your teeth play a major role in how you look. In case you haven’t fixed an appointment, don’t worry, we have some tips and suggestions to help you keep those pearly whites shining this Christmas season. One of the main culprits of ruining the teeth enamel is those fizzy drinks that you gulp down during parties. However tempting they may be, they erode the enamel and cause discoloration. Smokers tend to smoke heavily during the festive season. However, tobacco causes the teeth to turn yellow in a very short span of time, especially when teamed with starchy food and fizzy drinks. Therefore, limit your intake of cigarettes and keep a count on how many you smoke per day. Don’t overdo just because it is the festive season. While you are aware of the importance of brushing and flossing, make sure you do it religiously this festive season-twice a day. It will improve your oral health and will also help you get a brighter smile. It is common to go off to sleep after parties, without paying attention to our oral health. Don’t make this mistake and make sure to brush and floss at least twice a day, especially after parties. In addition to brushing and flossing, make sure to rinse your mouth with a fluoride mouthwash as it will help to keep the mouth clean and also make the teeth look shinier. You do not need to do this every day, just a few times a week will suffice. If you wish to indulge in some teeth whitening at home you can do so by using teeth whitening strips which are easily available in markets and pharmacies. These strips are easy to use and also affordable. It takes just 30 to 40 minutes to use these strips and you are ready to enjoy any party with those pearly whites. Do not rely simply on whitening toothpastes as they only serve to clean your teeth and not whiten them. While they may make claims of being used by dentists, the amount of hydrogen peroxide used in the toothpastes is not enough to bleach your teeth. Thus, rather than wasting your money in buying such costly toothpastes, it is advisable to either book an appointment with your dentist or at the most use shining strips. 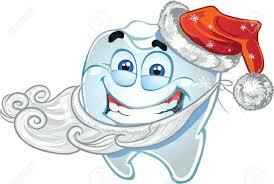 Everyone wishes to look good during the festive season, but very few take the time to whiten their teeth. Make sure that you do not make this mistake and start taking care of your pearly whites before the run up to the festive season. May your smile light up the Christmas party. Don’t Lose Your Dental Benefits!!! Bulk Bill Your Child’s Dental Today!